I recently came across a stunning photo essay via National Geographic. 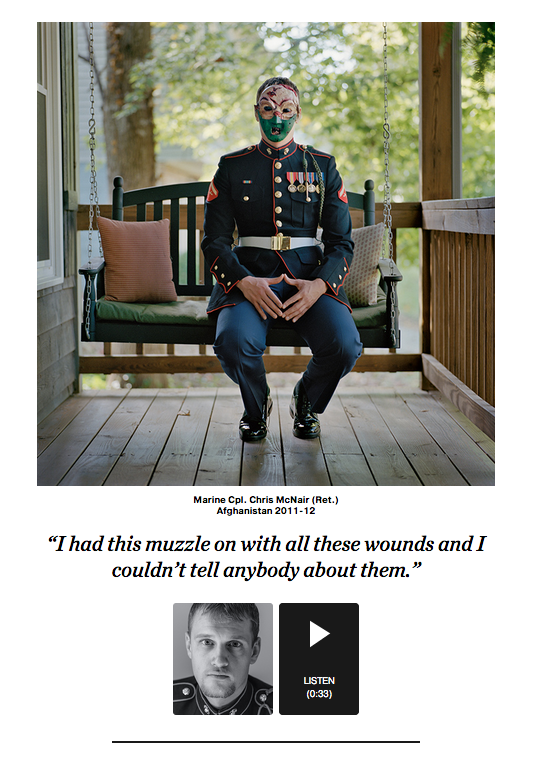 Titled Behind the Mask: Revealing the Trauma of War. Soldiers who have returned to the US from Iraq and Afghanistan undertake art therapy classes creating masks to represent their state of mind. Images painted on their masks symbolize themes such as death, physical pain, and patriotism. While the idea of creating art to represent How We Express Ourselves is not a new one, especially to those who teach in PYP schools, what is interesting about this exhibition of work is the personal narrative that accompanies each mask. This could be a beautiful way to showcase student art work. Using an app like Book Creator, photographs of the art and artwork, typed text, and audio recording could be seamlessly added to a book and then exported as an iBook or video. You could even add a soundtrack to your book. Book Creator has become one of my favorite apps. It’s functionality, ease of use, multiple features, and intuitive features make it accessible to my Grade One students to use independently. And it would seem I am not alone in my praise of this app. Book Creator was awarded the Judges Choice Award for Educational Apps in the Bett Awards 2015. The Bett Awards play a key role in identifying and rewarding innovative ICT resources and services for use in education, and awards are considered the highest accolade in the industry. In my humble opinion, it is totally deserved and I am grateful for the continued innovation and refinement that the Book Creator team put into their app development.